Nonfiction; 132 pages; author – Svetlana Kouznetsova; editor – Keith Morrill; cover design – Nik. Do you have a podcast, video series or upcoming live event? Do you want to increase your audience tenfold? We have the solution, and it’s captioning. 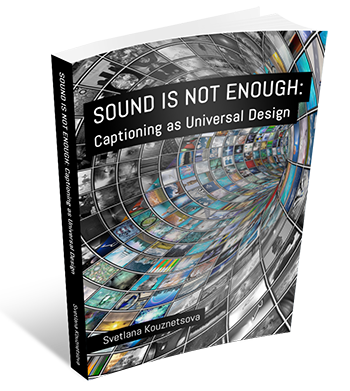 In her book, Sound Is Not Enough: Captioning as Universal Design, Svetlana Kouznetsova will show you how to capture these new viewers and take your audience to a whole new, and diverse, level. But audio and video producers aren’t the only ones who can benefit from Sound Is Not Enough and captioning! anyone interested in improving communication and information access. Inside, you will find common myths about deaf and hard-of-hearing people, the author’s personal experiences with deafness, and many examples of quality captioning for various types of aural information enjoyable by anyone, regardless of hearing abilities. Because sometimes, sound is not enough. If you enjoyed the book and need Svetlana to provide customized services for your project (to make your audio, video, event accessible) or to speak at your event, contact Audio Accessibility. Sveta’s book provides a comprehensive and extremely informative overview of the challenges that deaf or hard-of-hearing people face during everyday life – at home, at work and whilst traveling. It should be essential reading for anyone who wants to provide services to, or reach out to the market of over 640 million deaf or hard-of-hearing people worldwide. Whilst the use of captioning (closed or open) is covered in detail, the book providing clear guidelines and suggestions to incorporate captioning as part of a system or service, it also focuses on the benefits that captioning brings to all users of the system or service through universal design. As a business professional with normal hearing, this book has made me realize how much we take for granted every single day, and how much deaf and hard-of-hearing people need to work in order to get the same spontaneous information that comes so easily to people with normal hearing. Assuming that the use of Sign Language, Lipreading or sticking an interpreter in front of a room is the answer to the problem is short sighted. These methods may be useful in certain situations, but is not a good enough solution for the inclusion of deaf and hard-of-hearing people so that they may be productive in and engaged in society daily in every situation in Real-Time. The author suggests in great detail how Universal Captioning is an innovative alternate solution to the concerns for Full Communication Access among not only deaf and hard-of-hearing people, but also how it is beneficial for everyone (eg. people with low literacy skills, foreign language learners, foreign language speakers who have a heavy accent and hard for others to understand, or for people with normal hearing who are in a noisy or restrictive environment). This book raised my awareness and made me recognize that with the rise of Technological advances (such as the internet/texting), along with new Laws that have been put in place to support deaf and hard-of-hearing people, the only thing that remains to be improved is our Attitude toward making a difference. I think that many people ignore and/or belittle the importance of providing alternate ways to communicate. This book strives to help us understand, urges us take responsibility and use the resources necessary to provide quality captioning and communication improvement on a universal scale. Excellent read for anybody who is trying to be inclusive, especially businesses. This is a comprehensive guide to the many uses and applications of captioning technology, written in a straightforward, friendly style. As both a deaf woman and a professional accessibility consultant, Ms. Kouznetsova is extremely knowledgeable about the benefits of captioning, not only for people with hearing loss, but also for aiding in English language learning, literacy, remote viewership, and many other aspects of universal design. She describes industry best practices, compares the pros and cons of various types of captioning, and offers tips on how to determine the quality of a captioning professional before hiring them. An indispensable resource for anyone who might need to provide captioning access to a client, customer, patron, employee, or student. Highly recommended.